Just about everyone knows how horrendous Maine winters can be. That's why we have assembled some of our best winter defense products together in a nice gift crate. 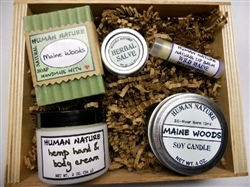 Our kit includes the following: a 2 oz Jar of Hemp Hand & Body Cream, a 1/2 oz. tin of Herbal Healing Salve, a tube of Wild Maine Blueberry Lip Balm, a full bar of Maine Woods soap and a Maine Woods travel tin soy wax candle. Crate is wrapped in shrink wrap along with a product & description label for easy gift giving.